I have always enjoyed traveling by riverboat. My trips on the Nile, Danube, Rhine, and Mississippi Rivers have always been a relaxing pleasure. 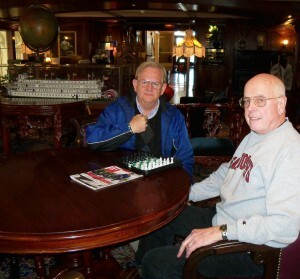 On several of these trips I have encountered passengers who also enjoyed playing chess. On this occasion I was on the American Queen steamboat that sailed from Memphis to New Orleans on the Mississippi River. As I walked through the Mark Twain Gallery on board the American Queen, I noticed a gentleman who was seated looking at a chess set made of glass. I recognized the set and paused to see what was happening. He turned to me and commented, “I would play on this set, but the dark colored squares have lost their color and you cannot easily see the difference between the squares.” I agreed and asked if he played a lot of chess. Frank introduced himself and said, “I used to play in the past when I was in the military.” I made further inquiries, and he answered, “Here are my recollections on how I learned to play chess back in the early 1960’s. I was stationed at McConnell Air Force Base in Wichita, Kansas as a brand new Lieutenant assigned to the 381st Strategic Missile Wing. The Wing’s mission was to man, maintain and operate 18 Titan II missiles that were situated around the city of Wichita, some as far as 50 miles away. Each missile site was made up of one in-ground missile silo and a 3-story underground control center positioned about 150 feet away. Once they became operational in mid-to-late 1963, they were continuously manned by a 4-man crew consisting of two officers and two enlisted men. This was at the height of the Cold War where nuclear deterrence through a strategy of Mutual Assured Destruction (with a very appropriate acronym of MAD) was the national defense policy of our country. Another Lieutenant by the name of Jack Cullen and I went through missile school together and became friends. It was he who got me started playing chess. So when we got assigned to our respective crews, we would check our work schedules to see when we would be pulling an alert tour, which were 24 hours long, on the same day. On those days we would be sure to take a chess set out to the missile site with us with the idea that as free time became available during the tour we would get a chess game started via normal telephone connection from silo to silo. Although each crew member would normally get between 4 to 6 hours of sleep during the 24-hour stay, it was not always at the easiest time to catch some shut-eye. At least one officer and one enlisted man had to be alert and ready to copy the launch message at all times. I found that planning my next chess move was a big help in keeping my mind alert during the wee hours. Usually we would be able to complete one game during the 24 hours as long as our sleep schedules were somewhat compatible. Frank’s story was completely unexpected as most persons learned from a brother, friend or school teacher. I told him that I had a folding magnetic set in my cabin. He agreed to play a game of chess and I made a new friend. As was pointed out, Frank was a slow, deliberate and accurate player. The game continued with me winning a couple of pawns and the game. I sent him six of my issues of Chess Life. 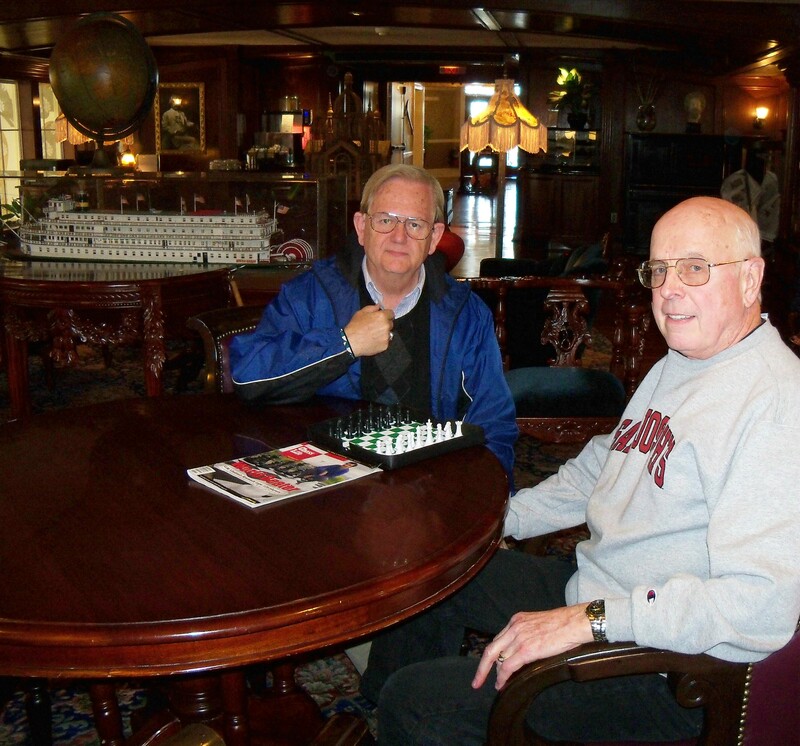 How appropriate that we met and played chess on the American Queen!